At Mobile World Congress 2016 in Barcelona, there were several exciting highlights for Fraunhofer IIS. 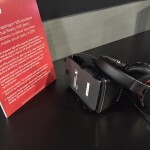 Starting with the announcement of the LG 360 VR featuring Fraunhofer Cingo and HE-AAC to the availability of phones with EVS enabled chipsets, the show struck a strong tone for trends for 3D sound for VR and high-quality phone calls. Also, a surprisingly high number of dragons could be seen and heard in Barcelona. 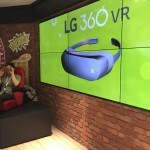 A major trend at Mobile World Congress was virtual reality devices and applications, with demonstrations by Samsung and LG sticking out from the crowd. Samsung installed an impressive motion ride theater to demonstrate the realistic virtual reality experience of the Gear VR headset. Samsung’s Gear VR has come equipped with Fraunhofer Cingo and HE-AAC technology since its first appearance in the market as a developer’s edition. On the other side of the aisle in Hall 3, LG introduced its brand new LG 360 VR headset. Fraunhofer Cingo and HE-AAC also bring an impressive audio experience to the users of the new LG360 VR headset. In addition to Samsung and LG’s exhibits, Fraunhofer IIS demonstrated its capabilities in the field of 3D sound for virtual reality at the Fraunhofer booth. From sophisticated algorithms for capturing 3D sound to post-production tools for digital audio work stations, and MPEG-H and Cingo for the delivery and rendering of 3D sound, Fraunhofer IIS showed everything content producers and device manufacturers need to setup an impressive 3D sound experience for virtual reality. Visitors to the Fraunhofer booth were able to use a DAW plugin developed by Fraunhofer IIS to live mix 3D sound of a roaring dragon and afterwards fully immersive themselves in a virtual reality experience. Qualcomm, a member of the MPEG-H Audio Alliance, also showcased an MPEG-H based virtual reality demo. Visitors to Qualcomm’s booth were able to experience another dragon, whispering into the ears of the users from different locations. Qualcomm also presented an EVS demo at their booth. This demonstration showed the capabilities of the new 3GPP Voice over LTE (VoLTE) codec. VoLTE provides highly improved voice quality compared to today’s regular or HD Voice phone calls without increasing the necessary data rate. EVS is now an integrated part of the Snapdragon 820 chipset – yes, another dragon on the show floor. Any phone using this chipset will eventually be capable of handling EVS phone calls as long as the operator supports the codec. Several phones with this chipset were introduced at Mobile World Congress, for example Sony Xperia X Performance, LG G5, Xiaomi MI5 and certain models of the Samsung Galaxy S7. 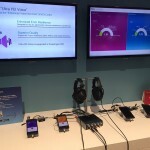 The EVS demo at Qualcomm’s booth demonstrated a live VoLTE call using smartphones from Sony with the Snapdragon 820 chipset and an Ericsson IMS server for the VoLTE call setup. A signal generator simulated packet loss. This complete setup allowed visitors to compare the high audio and voice quality of EVS to the HD Voice codec AMR-WB under real-life network conditions. In addition to the live demo, visitors of the Fraunhofer booth could compare the great audio quality of EVS in a file based demo. 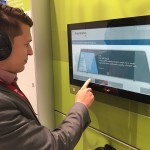 In a similar demo at the Fraunhofer booth, visitors were able to make live phone calls with the option to switch between regular, HD Voice and EVS. At this year’s show, it was exciting to feel the buzz and level of enthusiasm around the idea of the perfect audio experience for entertainment and communication systems. And again, Fraunhofer IIS was able to validate its leadership position in the field of mobile audio through Cingo, MPEG-H Audio and EVS.